Jacob Reider MD is senior policy advisor of the Office of the National Coordinator for Health Information Technology of Washington, DC. Tell me about yourself and your new job. I’m a family doctor from upstate New York. I’ve been involved in health IT for a couple of decades. I started off as a medical educator in the Department of Family Medicine at Albany Medical College and moved on to leadership roles in health IT there and at Albany Medical Center, obviously in Albany, NY. Left there and joined a group called CapitalCare Medical Group, which is the large primary care group in Albany, doing EHR implementation. There’s a sort of funny story to that one. Early in our EHR implementation, I posted this thing to this new communications platform called a blog. I started blogging in 1999. In about 2004, I put this post up about usability, which was a word people thought I made up, and how the usability of the EHR that I was using was missing the mark. About six months later, the president of the EHR vendor that I was complaining about contacted my boss and indirectly asked me to take down the post, because it was apparently costing them sales. That was Misys Healthcare, and the guy was Rob Kill, the former president of Misys Healthcare. I told my boss that last time I checked, this was a free country and I didn’t really have any intentions of taking the blog post down. Then I actually started a dialogue with this guy, Rob Kill, and eventually he hired me to help them look at themselves in the mirror and try to improve the user experience of the EHR product. That may be answering your question about my background, because I eventually moved on from CapitalCare to Misys Healthcare, where I was medical director. Then we merged with Allscripts and I was CMIO of Allscripts for the last handful of years. Then started interacting with folks from the government, and started to go back to my roots of idealism and thinking I could help solve really big problems. Got enticed to join Farzad’s team, because I was really inspired by the work that folks here are doing and the people who are here, who are just great folks who have the right vision and passion for getting things right. Sorry if I sound like a TV commercial. What is your title and area of responsibility? My title is senior policy advisor, which sounds very government. I tried on Luke Skywalker and Jedi Master, but so far we’ve got senior policy advisor on my business cards. How much of the problem to get physicians and clinicians to use systems is because of usability issues? 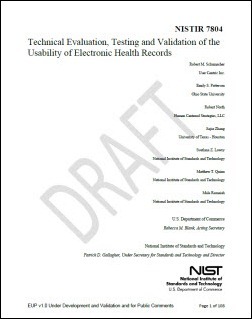 Are you familiar with the NIST draft usability publication that was put out about a week ago? I didn’t read it, but I heard it was out. In that document, NIST calls out some fairly good evidence that user experience / usability is a barrier to broad EHR adoption. That’s not my opinion – that’s been stated by NIST in the publication. That was my callout in 2004, that these things were not optimal to use. I like to think of usability as kind of a milestone on the continuum of user experience. I’ll burden you with a little bit of my view of the world. As a very basic component, if we think about any new technology, new tool, new anything, you’ve got at the basic end, functionality. Does the thing do what it was intended to do? It’s something functional. Beyond functional, you’ve got reliable. Does the thing do what it’s supposed to do every time? An example of functional is a Model-T car. It works, but Model-T cars came with toolkits because they broke, so they weren’t reliable. EHRs years ago – I can vividly remember that the system would go down at midnight every night for backups for four hours. They weren’t reliable. They were functional, perhaps – they did what they were intended to do – but they weren’t reliable. I think we’ve nailed functionality, we’ve nailed reliability, so as the maturity of any new technology evolves, you evolve up the continuum, so you get functional, reliable, and usable. Usable implies that you can accomplish tasks efficiently; you can do things in an intuitive way. NIST’s document does a great job outlining how you can quantify usability. There’s an argument that it’s subjective, but I think they’ve documented that it’s quantifiable. Beyond usability, you’ve got meaningful, so it does stuff that’s important. And then pleasurable, that it does stuff elegantly. Apple is a great example of a company that has reached the maturity pinnacle of pleasurability and not just usability, functionality, and reliability. Longer than I intended to blab about, but does it make sense? People tend to react emotionally to the term usability, thinking it means somebody else designing their screens or taking away their competitive advantage, but in fact there is a usability science that has its own body of literature and its own professional groups. How do you take emotion out of what people think usability means and turn it into something that can move ahead constructively? I think the NIST document outlines best practices that are not just from our industry. If you want to design an airplane or an iPad or a coffee pot, there are methods that you use, and one of those methods is called user-centered design. As you mentioned, there’s a whole field that’s devoted to this. If we talk about using the right method and using the right processes, very frequently that disarms some of the emotional response and we can start to talk collaboratively. That is what everyone wants to do. I don’t think anybody’s opposed to better usability. You’re not going to hear a user or a vendor or anybody from the government say, “We’re opposed to that.” It’s just The question of who should do what as we look to lever or accelerating that evolution of usability as it has evolved well, obviously, in the consumer electronics space. How do you see your role specifically and ONC’s role in general affecting usability of software? There are two areas that I’m really focused on as we move forward. One is clinical decision support and the other is usability. I actually think they are tightly linked. If you look at some of the great design literature from professionals like IDEO, who do a lot of innovation design, and Neilsen Norman Group, these are folks who were involved with the original Apple product and many other things that you’re familiar with. You see how the design actually guides the actions of the user. A really well-designed door handle guides what I do. I think clinical decision support is not about alerts and reminders and hitting docs over the head with two by fours when they do things wrong. It ‘s about guiding care providers to more easily do what’s right and less easily do what’s wrong. Usability and CDS in that way – and that’s why I’m blabbing about this – fit together really nicely. My role is to listen to the market, to end users, to eligible providers, to hospitals, and to vendors, and learning about all of these perspectives. Right now that’s the place that ONC is. We’re listening. We’re listening to the experts. This report that NIST produced just a week ago is open for public comment. We’re very interested in the reaction to that document. It’s in the 30-day comment period and they’ve got a Webinar coming up. The more feedback they get — and by extension, we get –about that, the better, so we can learn more about what other folks think ONC’s role is in terms of facilitating the evolution of user experience in health IT. Why hasn’t there been a market for usability, where somebody comes up with a more usable product that takes business away from less-usable products? I think there are a couple of answers to that. We talked about Apple a little bit. In many cases, Apple Is a great example of great usability, great user experience, etc. Raise your hand if you owned or have a friend who owned the Newton. Did you have one? But you remember them, right? Apple, of course, had some failures, too. If you look at that company, they’ve been through 30 years of fairly rapid evolution. They’ve succeeded in the long run because they’ve iterated over and over and over. Steve Jobs talked about how he just picked himself up and tried and tried again. Three decades of evolution from Apple that’s created that. And of course, the replacement cycle of a Mac or an iPhone is much more rapid than the replacement cycle of a $50 million electronic health record. I think part of the answer to your question has to do with the maturity of the market. The market hasn’t matured as we know, with maybe 50% of this market is now penetrated, which means it’s still a young market. We’re not nearly as mature as the consumer electronics market. The other is the replacement cycle is slow, so you don’t have folks saying, “Oh, I can do that in three clicks in one system and 17 clicks in another, therefore I’m going to buy System A.” It’s just not as easy to rip and replace as it is your iPhone. In your writings, you’ve said that usability guidance is what’s needed, not guidelines or set requirements. How do you see ONC positively affecting usability? 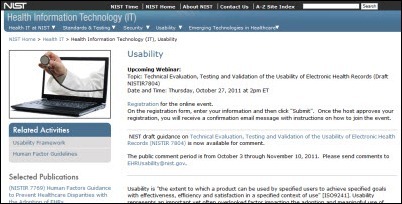 This summer, ONC, NIST, and FDA had a usability workshop. Along with the release of this document from NIST, the federal government will have have a wiki, where we’re going to invite participation from all communities and collaborate so that we can all openly discuss what the opportunities are. If you’re asking me, “What’s ONC going to do next?” I can say honestly that I don’t know the answer, because what we’re trying to do is be intentional and/or deliberate about what we do next, why, and how, so that this isn’t something that anybody in the market perceives as reactive in any way. What ONC does will be product of dialogue and not something that we just pull out of the seat of our pants. If we understand the concept that usability can be measured, do you see it either becoming a certification criterion or there being government-sponsored publishing of usability scores of software? I can’t really answer that question. Sorry. I did forget to ask you one important question. When did your job start? I started here on October 3. I’ve been here, gosh, almost three weeks, and it’s flown by in a millisecond. The NIST document is a good thing to link to. The dialogue is important. Even if you solicited comments and you said something pithy and got your readers to throw in feedback, we would definitely pay attention to that – what people are saying on HIStalk about this topic. If you link to that and say, “Hey, what do people think about the NIST document and what’s the reaction to it?” That would be very interesting to us. Another difference between the consumer electronics market and EHRs is that usability issues with a cell phone, while perhaps annoying, aren’t potentially deadly. From my read of it, the NIST protocol is focused on vendors being able to show that people who are likely to use their products won’t make mistakes that harm or kill patients. This seems completely appropriate given the government’s obligations in this area and the failure of the HIT industry to police itself. Is the HIT industry really going to force the government to intervene? Are any RECs or health systems asking for the results of evaluations like the one that NIST has provided? Making rigorous evaluations public would go a long way I think. Well then but, good report interview. Dr. Reider statement “I think we’ve nailed functionality, we’ve nailed reliability,..”, in all due respect to him, is very very incorrect. Look at the CPOEs out there. Like no one knows of the errors from their idiosynchratic functionality. My experiences is like yours was, when I complained, you know then but, I was shut up by hospital and vendors. With children to feed, I shut up and let patients die you know from mistakes of oor functionality of MDDS, EMR, CPOE, and your so called decision supports. If you, ONC, and vendors wish to hear, you know, from the doctors and nurses users the truths of horrific care from HIT, protect their jobs from retaliation and shams peer reviews by conflicted administrators and supervisors. Doctors are afraid to talk and you know, they have no place to complain. ONC, do you want to set up a confidential hot line or reporting system, as the MedWatch at FDA, and advertise its availability? Well then but, as things stand now, you will not hear of the problems because number one, doctors are punished if they complain and the vendors and hospitals always blame users for the deaths. I am also interested in your formal informatics education. Please tell us. Thank so very much for your interview. Good interview with Dr. Reider! I would caution readers from fixating too much on, for example, disputing each item in the heuristic (expert review) criteria and instead focus on this document as what it is: guidance to help people developing (and probably customizing and implementing) systems do it with better incorporation of human factors considerations. If you’re an EHR vendor and the approach that NIST has laid out in this document is foreign or threatening to you, then you probably have the most work to do in getting up to speed on user-centered design and other human factors concepts. If you’re already taking a similar approach and you think that you can improve on what NIST has developed, share it with them. While it is great that ONC has hired Dr. Jacob Reider, why is there still no federal plan to ensure that EHRs are safe and usable? It’s not as if this is a new issue. And there were policy committee meetings a few months ago in which Dr. Reider testified for the EHR Vendor Association and Allscripts. Why all of the foot dragging? What is the FDA’s role in this? if ONC fails to lead? 2. Continuous process improvement to improve outcomes and increase patient care. 3. Emergence of research projects to investigate new ideas, procedures, drugs or care strategies. Serving these needs requires EMRs that are readily adaptable within one day. As far as I know no large suppliers could provide adaptation within a month let alone a day and many would not do it in a year if at all. The real solution is to have a technology that allows the clinical users to design the system. The current techniques of software engineering can enable that type of solution. The incumbency of big HIT companies prohibit it.